I am Arun Kumar working at Bank of America, Hyderabad, India. This appeal goes out as a humble request to all our well wishers. On 6th of July’ 2017, we were blessed with a baby boy at Ankura Hospital for Women and Children, Begumpet, Hyderabad, India. 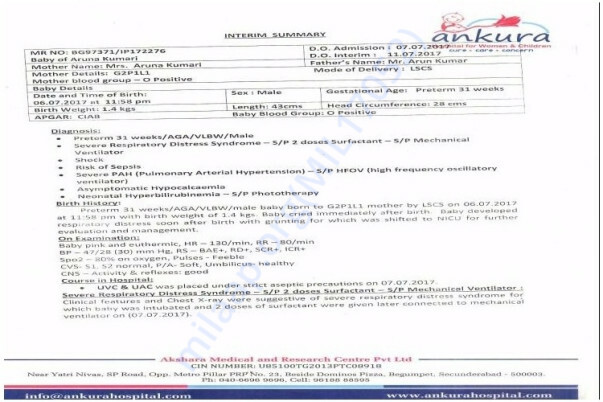 But the boy was born as a pre-term 31 weeks baby with birth weight of 1.4 kgs. Baby developed respiratory distress soon after birth with grunting. The lungs were not completely matured for which he was shifted to NICU for further treatment. 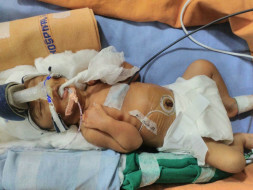 The baby needs to be kept in NICU for 3 to 4 weeks at the same hospital. The NICU charges for single day is Rs.15000 excluding any medical investigations conducted and pharmacy bills. 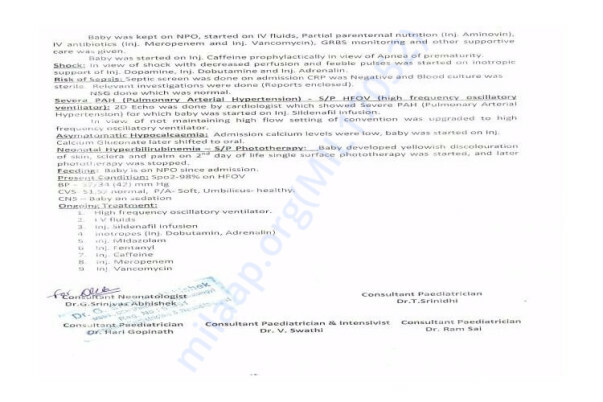 For medical Investigations and medicines, hospital is charging another Rs. 5-10K per day, summing up to Rs. 20000 to 25000 approximately per day. 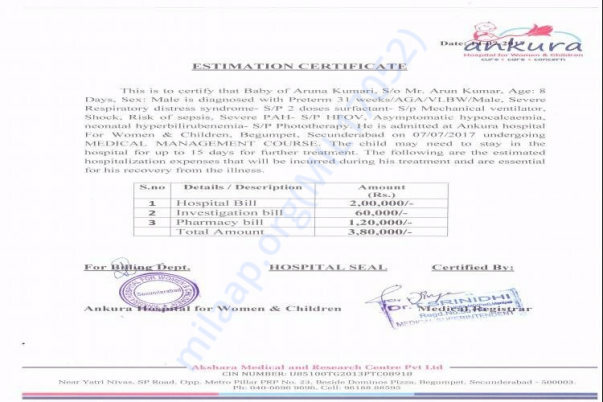 As the baby need to be kept for minimum of 4 weeks (28 days), the total bill would come around 4-5 lakhs. 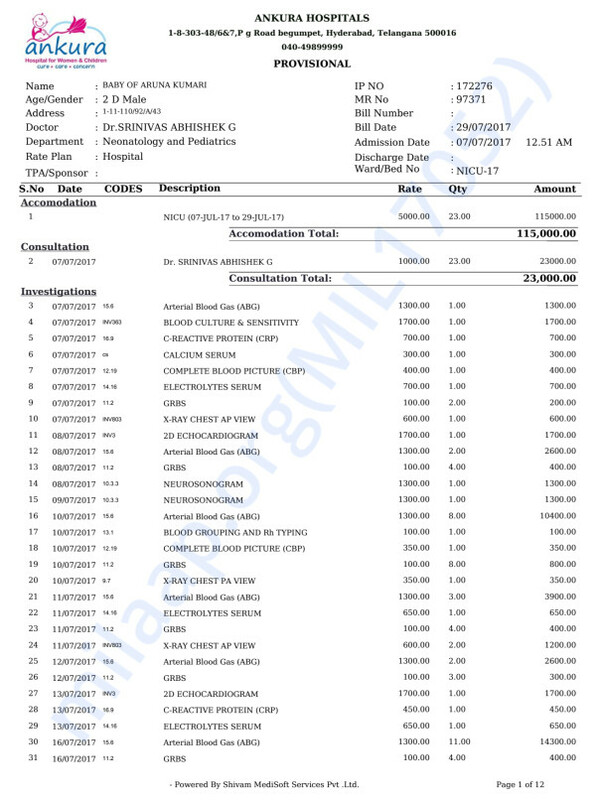 The Hospital bill for my Wife’s surgery is Rs. 58000 and bills for the baby till today is Rs. 1,30,000. I have managed to arrange Rs.1.5 lakhs from personal savings, family members, friends, colleagues. I have and paid the bills for wife’s surgery, medicines and some part of the child’s bill till date. Now I am exhausted with all the sources of funds and no longer bear the cost of treatment of our child. Then I came to know about this MILAAP Fund Raising campaign from a well wisher and we are desperately seeking help through this forum. Now this is the only hope we have. Kindly help us generously to save our child to reach home safely and healthy. 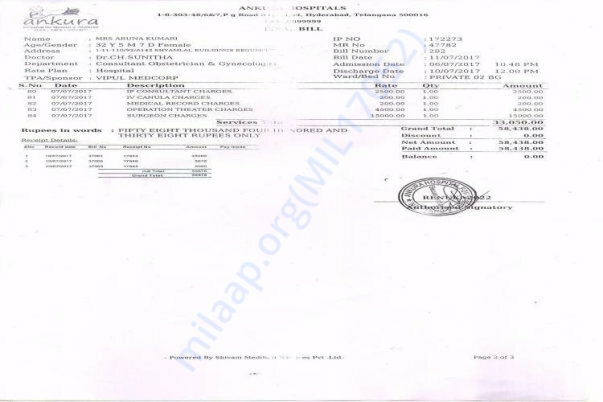 I am attaching the Interim summary and Bill Estimate documents of the child and the copies of Bill which I already paid for my Wife's surgery. Through this fund raising campaign we look forward to contributions that are very crucial, however it won’t be the amount contributed, but the mere gesture for which we will be most grateful and indebted for our lives. Thanks a lot, God bless you all. Our baby is now doing good now. We celebrated Diwali very happily. Need all your blessings to my child for his long and healthy life. Thanking you all once again for all the love and support. Our baby's recent pics. He is doing very good now. Thank you all once again for your tremendous support in hour of need. I would like to thank each and every supporter personally who has contributed and helped me to meet the medical expenses for my child's treatment. With all your blessings and support, our child got discharged two weeks back and recovered very well now. After discharge we are taking our baby twice in a week to hospital for post hospitalisation medical checkups. Last Thursday blood test is conducted and reports came as positive. Doctor's advised to take care of the baby in coming days till baby reaches weight of 3.5 kgs. Present weight of baby is 2.345 kg. We received a good amount through this fund raiser which helped us a lot. Thanking you all once again. God bless you all.